Looking for some design inspiration for your next landing page? We’ve just started a new landing page examples section in the Unbounce blog where we’re going to feature the best examples of landing pages that we find on our marketing travels. In each post we’ll break down the anatomy of the landing page and look at what’s good and where they could be improved. An example of excellent message match between banner and landing page is shown by Full Sail. They also offer up 2 different design versions to test their messaging in an A/B test. 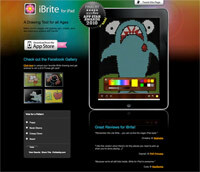 An e-commerce landing page for the iBrite iPad app. Includes an energetic video demonstrating the app being used. A beautiful landing page from email provider Campaign Monitor, that should serve as inspiration for your click-through page designs. 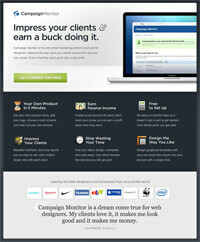 A super simple and clean lead capture landing page from Webtrends. The thumbnail shown is only a small portion of what is a long landing page from cosmetics company Glow. Read the full post to learn how they constructed one big page out of several smaller screen-sized landing page areas. We’ll be adding new landing page examples every week, and if you have one you’d like to submit for inclusion be sure to drop me a line at oli@unbounce.com.